With an Expected Market Time of 122 days, the market transitioned into Buyer’s Market territory for the first time since January 2011. It is all about a smorgasbord of choices. That’s exactly how it is shaping up for buyers in today’s housing market, a smorgasbord of choices. Many believe the market is slowing because of the holidays or because of the mid-term elections. Yes, festive cups are back at Starbucks, but the Holiday Market does not really begin until this week when all of the distractions really set in. Presidential elections often, statistically slow the momentum of housing for a moment, but not during mid-term elections. The slowdown is not because of the holidays and it is not because of the mid-term elections. There has been a noticeable shift in the housing market since March of this year and it has not stopped evolving ever since. Typically, during the Autumn Market, both supply and demand drop. The peak in the housing inventory predictably occurs between July and August, and then drops once the kids go back to school. This year, the peak occurred in mid-October at 7,292 homes, and today, stands at 7,218, a drop of only 1%. Since 2012, the inventory, on average, has dropped from the end of August to mid-November by 17%. From the end of August to mid-November this year, the inventory has increased by 3%. Similarly, demand, on average, has dropped by 14% since 2012. This year, it has dropped an astonishing 24%. With a much higher supply of homes, 53% more than last year, and muted demand, 24% less than last year, the Expected Market Time (the amount of time it would take to place a home on the market today and open up escrow down the road) has not stopped climbing since August. Typically, it remains flat through the end of the year. Today, the Expected Market Time eclipsed the 120 mark for the first time since January 2011, climbing to 122 days, Buyer’s Market territory. 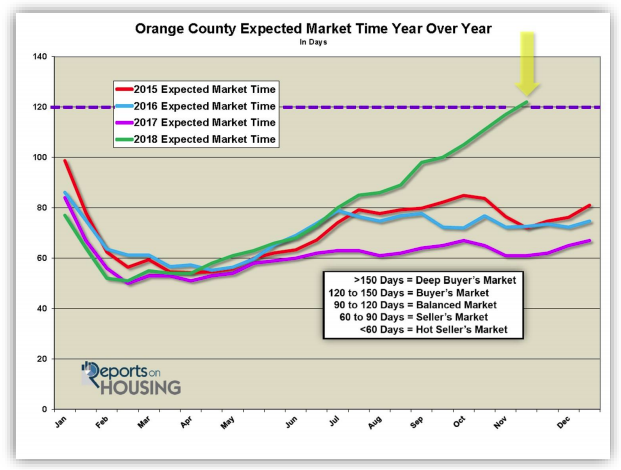 Statistically, Orange County housing is a slight Buyer’s Market, ending the six-and-a-half-year market run-up. What does it mean to be in a slight Buyer’s Market? First, home values are NOT dropping like a rock. As a matter of fact, homes that are highly upgraded, in great condition, show like a model home, and are priced right, will fly off the market within the first few weeks. Everybody else will sit and wait. There just are not enough buyers looking to purchase. Now, more than ever, price is unmistakably THE most important ingredient in order to find success. Homes that back to busy streets, homes that need a lot of work, homes with deferred maintenance, homes lacking updates or upgrades, will sit for a very long time unless they are priced appropriately. Pricing according to recent comparable pending and closed sales is crucial, adjusting for location, view, condition, and upgrades. Sellers can no longer just price a home at the last comparable sale. The price must be adjusted according to a home’s features. Sellers will not have to wait very long if their homes look like a model, but the further the needle moves away from looking like a model, the more a home needs to be adjusted downward in price. One out of every four homes on the market today will not find success in this market. Many sellers simply do not have the stomach for doing what it takes to be successful today, and it all boils down to price. Homeowners who reminisce about the housing market in March, when it was still a hot Seller’s Market, and stretch their asking prices above comparable sales, will not achieve their goals in selling. Instant, multiple offers with buyers tripping over themselves to purchase is quickly becoming a distant memory. Today, sellers must price their homes with extreme care and then pack their patience. After being exposed to the market for 45 days, sellers should sit with their professional REALTOR® and analyze all current data and statistics, review buyer showing and real estate feedback, and consider adjusting the price considerably in order to entice a buyer to purchase.